Peace lilies tolerate low light levels and a wide temperature range, traits that endear them to indoor gardeners. There are dozens of hybrid cultivars, even one with curly leaves. On most plants, however, curled leaves indicate cultural problems. Curled or wrinkled leaves may indicate inconsistent growing conditions. 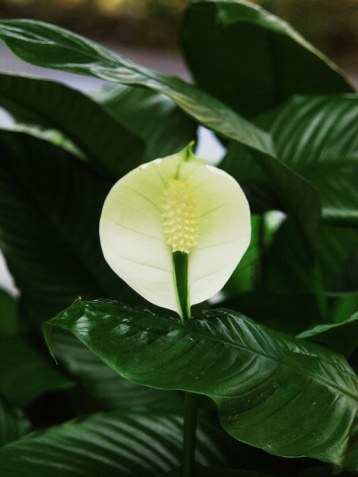 Peace lilies are members of the arum plant family grown mainly for their dark green foliage. They tolerate low to medium light but blooming plants need bright indirect light. They can tolerate nighttime temperatures to 55 degrees Fahrenheit but their ideal temperature range is from 70 to 90 F.
Curled or wrinkled leaves may be due to excess light or heat. Leaf edges may brown in the vegetative version of sunburn. Moving plants toward an east or west-facing window with a sheer covering where brightness does not exceed 2500 foot candles and keeping temperatures below 90 F may help cure the condition. 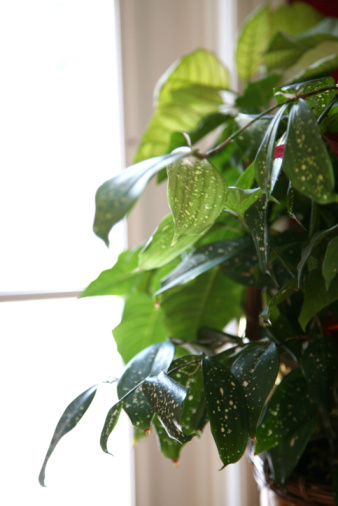 Stunted, wrinkled leaves indicate a peace lily that needs a rest or dormant period. Allowing the plant to go dry induces dormancy. Re-pot plants with clean soil and keep them moist, withholding fertilizer until they start growing actively.